The Friends of the OB Library met on Tuesday, April 19th. The current chair – George Murphy – has reported to us that the meeting had the largest attendance that he’d ever experienced. The group was riled up because of the draconic library closures and staff cuts proposed – once again – by San Diego Mayor Jerry Sanders in his latest budget presented to the City Council. The Friends’ position is: NO ADDITIONAL CUTS in this year’s budget over our last year’s budget. NO LIBRARY CLOSURES. NO STAFF CUTS FROM LAST YEAR. individually and collectively e-mail Faulconer and the entire City Council along with Mayor Sanders our position. 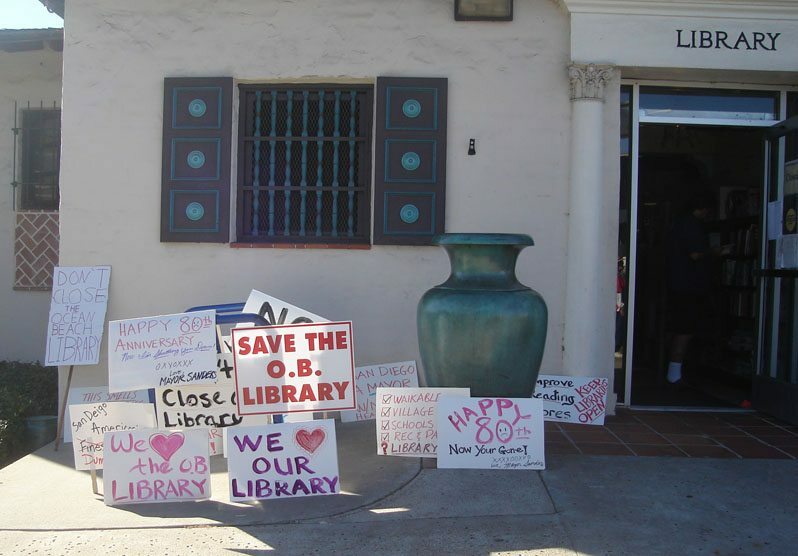 The Friends will sit in front of the OB Library collecting petitions on the following dates: Tuesday April 26 from 12:30 to 2:30 and again from 4 until 6; the same times will be staffed on Tuesday May 3. In addition, we will be at the Library on Saturday April 30 from 12 to 2:30. The Friends and their supporters plan to take these collected petitions to the City Council meeting on Thursday May 6 when the council will first see and discuss the upcoming budget for next year. Importantly, the Friends are exploring the idea of another ‘Rally!’ like Ocean Beach pulled off a couple of years ago. What do you think and will you participate?? Let us know. The Friends will be having their first evening meeting of the Friends on Wednesday June 15 from 6 to 7 p.m. By changing the time of the meeting, the group is trying to attract a ‘larger’ section of our community. To get in touch with the Friends of the OB Library and Chair George Murphy: obgeorge@nethere.com and phone 619-224-8898. Once again Ocean Beach steps forward to provide the leadership and vision for maintaining our library services! The Ocean Beach message of no cuts to hours, no cuts to staff, no cuts to the library department must be the rallying cry for all of our branch library constituents and Friends groups. We should coordinate rallies across the city on the same day and hand out leaflets explaining the cuts that target our kids, the elderly and the poor. I personally will stand proudly and in solidarity with the OB community. Thank you George. Unfortunately, the city’s budget is in dire straits. The money has to come from somewhere, and while I feel that libraries, the arts, music, etc are always (perhaps unfairly) considered expendable and the first to go, we’ve all known about the budget problems for years. It’s time for San Diegans to get serious about solutions. Unfortunately, this will result in some very real losses, but I don’t see how we can have our cake and eat it, too. The library cuts will not be permanent, and there are so many needs in San Diego that frankly can’t be met. Pensions, infrastructure, social services, it’s not going to end until we buck up and make sacrifices. The scary part is that we only see part of the picture- and it really is up to our Mayor and City Council to make wise decisions to help us get through this. I don’t like this at all- but when we face with tough problems…We need to make tough decisions. Best of luck to you guys- I will be rooting for you.